She already knows what a catch you are but there’s no problem showing her over and over. Here’s how to remind your wife or girlfriend of your love with a gift of style this Valentine’s Day by giving her a coveted designer handbag. The Susannah Hunter Valentine’s Day clutch is the ideal choice for the man who wants to hit this Valentine’s Day out of the proverbial park or who has a large budget and wants to spend it! The £360 investment quality bag, which is destined to become an immediate classic, comes from the award-winning Bloomsbury based designer whose collectible bags are carried by celebrities like Uma Thurman, Helena Cristensen and Nicole Kidman. 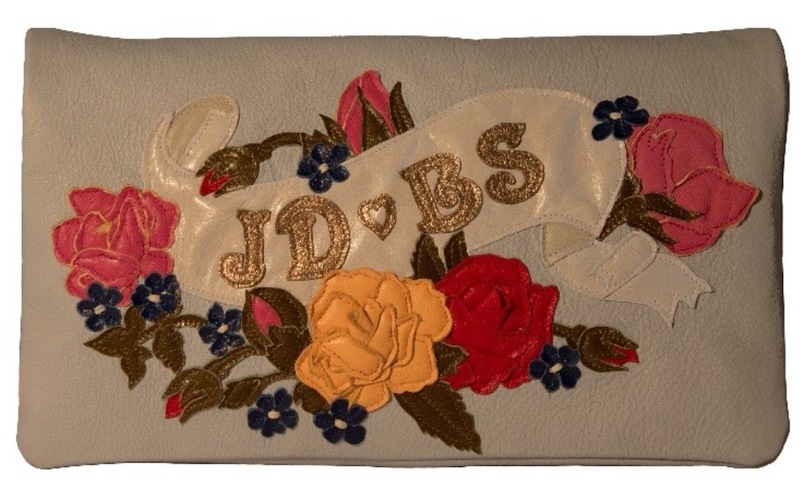 Inspired by an original Victorian floral design, and bearing the word love, this delightfully cool perla-coloured clutch and can also be customised with up to six or seven letters, to include a name or both your initials. And if you feel you need to make this captivating gift even more meaningful, you can fill it with chocolates, a matching key ring by Susannah Hunter, compact, or even mementos of your relationship and you will be set fair for a romantic Valentine’s Day she’ll appreciate and remember. 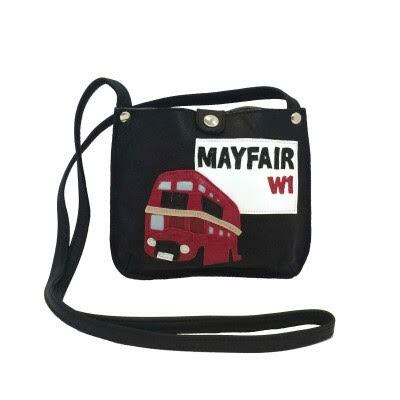 Described by Vogue as ‘One of those talents whose designs have collectability stamped all over them” Susannah Hunter’s leather appliqué handbags and accessories are coveted by discerning customers all over the world. Since her debut collection in 2000, clients have included Nicole Kidman, Uma Thurman and Helena Christensen. 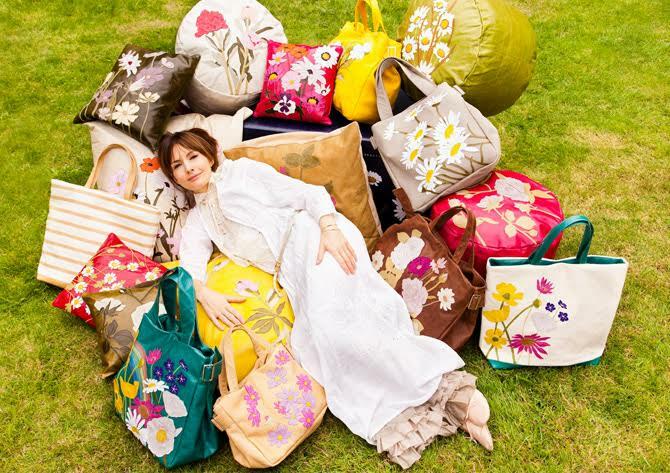 She also has a loyal following in Japan, where her sophisticated designs, uncompromising attention to detail and fine craftsmanship is celebrated. Susannah comes from a family of artists and studied Fashion Design at Central St. Martins, before working for Margaret Howell. 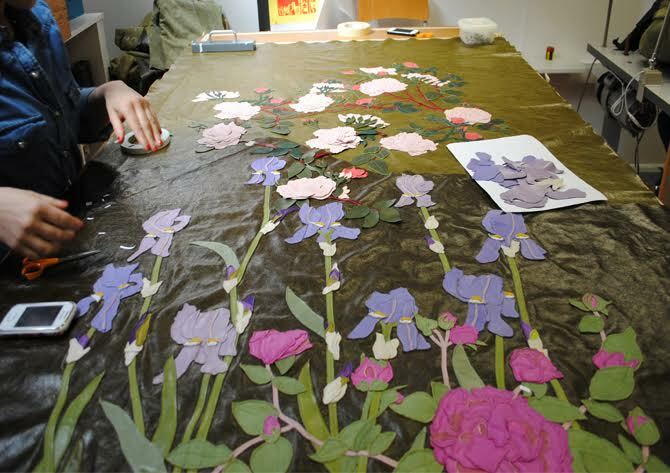 Her distinctive designs were born through her love of colour and drawing, particularly flowers. Indeed, this love has led her to work with The Royal Chelsea Flower Show on a number of occasions over the years. 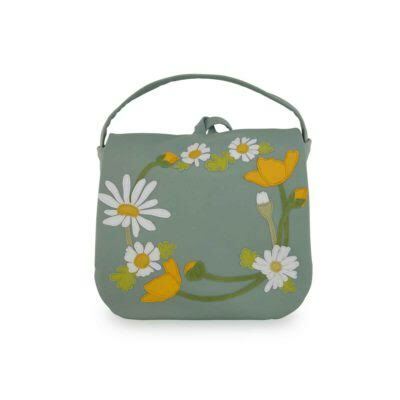 In 2006, Susannah was asked to design the limited edition RHS Chelsea Flower Show Bag, the first of six she created. The following year she was commissioned to design and create the show’s logo and Susannah’s purple anemone became the symbol of the glamorous gardening event. In 2011, she unveiled the final instalment of her highly covetable limited edition Chelsea bags – the Reine des Violettes rose bag. 2013, in partnership with award-winning garden designer Catherine Macdonald, was the year that saw Susannah create her first garden at the RHS Chelsea Flower Show. Sponsored by the Massachusetts Office of Travel and Tourism, the garden was a homage to Emily Dickinson combining real planting with 12 metres of Susannah Hunter leather appliqué walls adorned with roses, foxgloves, hollyhocks, hydrangeas, irises and wisteria – all hand cut and stitched in leather. With a leather waterway with appliqué water lilies bordered on either side, the garden just missed gold, winning a silver gilt medal, with both the London’s Evening Standard and the “i”newspaper naming it in the top five Chelsea Show Gardens of that year. In 2014, the Massachusetts Office of Travel and Tourism sponsored a bigger show garden. Named ‘The Massachusetts Garden’, Susannah Hunter, in partnership with Catherine MacDonald designed a garden which featured a 10 metre leather dunescape and 10 metres of leather hydrangeas – all inspired by Cape Cod, Massachusetts, and the beautiful coast by Provincetown. The garden won a silver medal. Susannah Hunter’s products are designed and handmade by a small, highly skilled team in her atelier in Bloomsbury, London, using only the finest Italian and British Leathers. Each new collection draws inspiration from the natural world and Susannah’s creations stem from pencil studies of individual blooms. 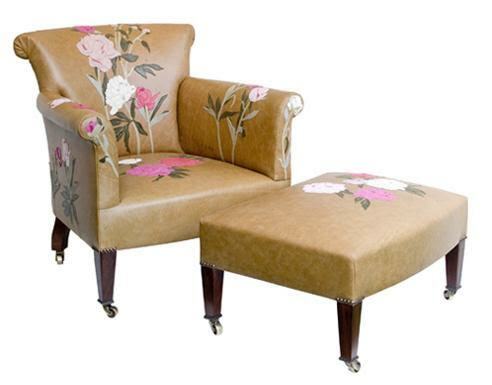 Created into beautiful designs, transposed into templates for patterns, hand cut, petal by petal from sumptuous coloured leathers, painstakingly assembled and sewn together; the same approach is applied to Susannah’s upholstery and wonderful bespoke furnishings collections, from cushions and armchairs to room dividers. Susannah Hunter also offers her special edition range of Monogram, Ciao Bella! 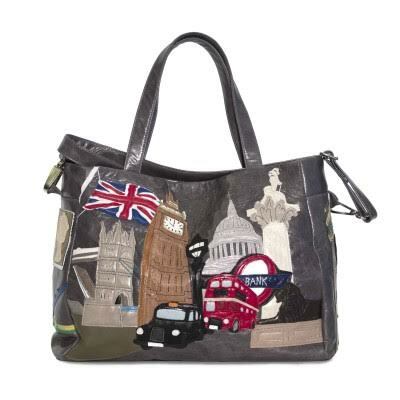 and City bags which feature luxurious Italian leather appliquéd with nappa leathers and cotton and velvet linings. 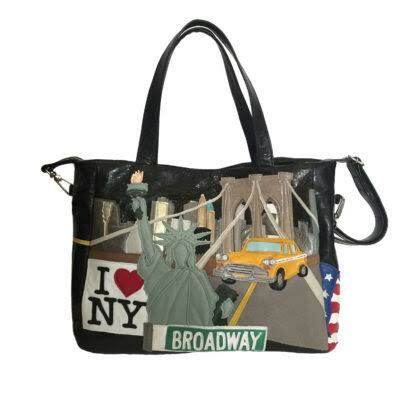 In line with her location, Susannah’s creations include the Bloomsbury bag, Regent bag, along with the London, Paris and New York bag. Clients can choose from the seasonal collections or opt to commission a completely bespoke project. In making their choice from the display in the boutique and her archive of flower designs, customers can choose from a wide array of stunning leather colours to achieve the bag of their dreams.